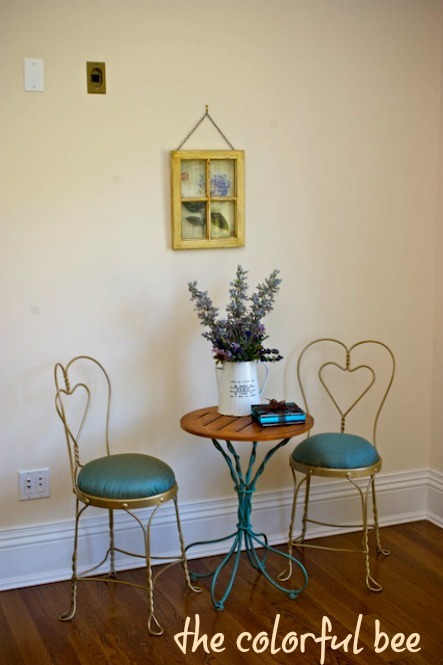 Something I don’t talk about quite so often on the blog is some of my Home Staging work. I thought I’d show you a project I did a little while back that was very successful. It was a $3.5 million house that was sold in 3 weeks. The property sat for nearly 2 years vacant and unsold until I put some furnishings in it. Some of these items were painted by myself and my crew…and we also did a little bit of faux finishing in the house as well to help sell it. We did everything in about a week – so it was a very busy week! Here are some photos from the home. 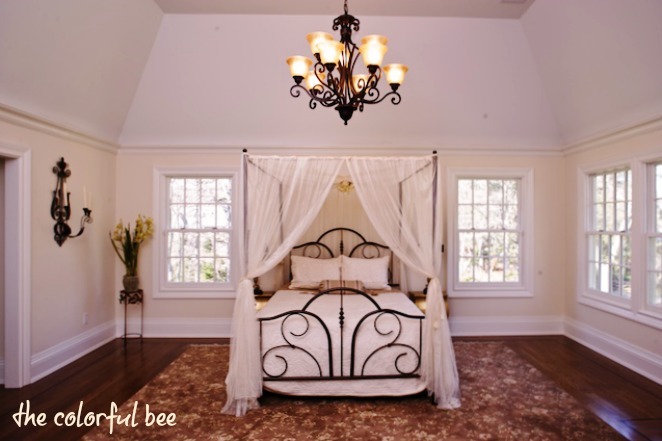 The Master bedroom was very large and tall, so we needed a canopy bed to fill some of the space. The gauzy drapery added a romantic element. . 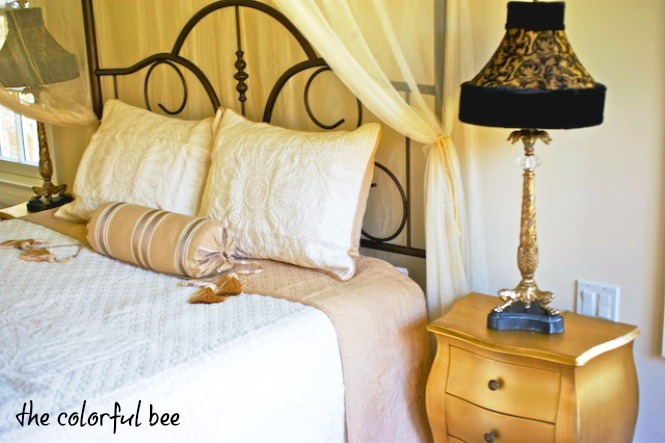 The canopy bedframe was originally black and looked too severe so I painted it a warm bronze. 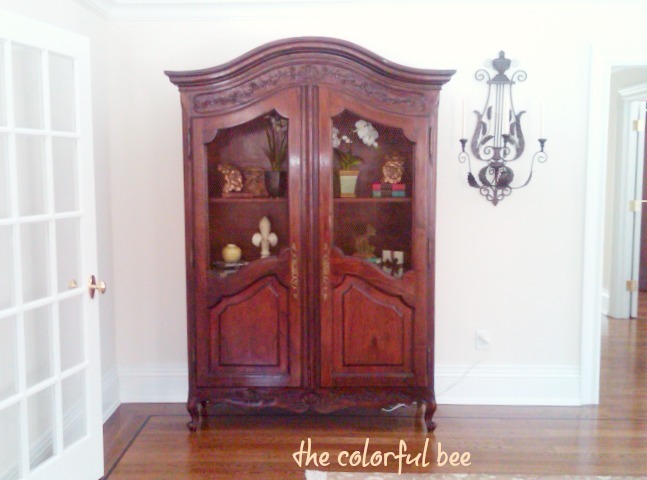 We needed large furnishings for this space – and luckily one of my clients was selling this antique armoire…so I just had to buy it. It now sits in my Master Bedroom. The Master Bath was pretty gorgeous all by itself but I added some towels, spa items, florals, a Chinoiserie wastebasket and some artwork to add some warmth. 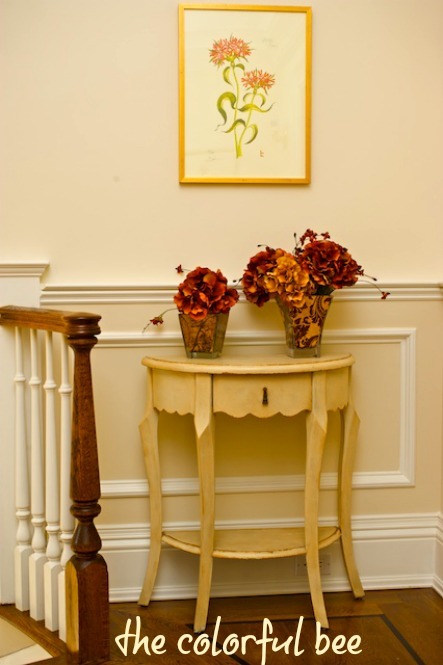 To warm up the hallway by the Master bedroom, I added some artwork, a painted, gilded and antiqued demilune table and some florals in eglomise glass vases. I always have the most fun decorating and staging children’s rooms. Here I added some fun touches with a black chandelier vinyl appliqué (found in HomeGoods for $10!) and I added some silhouette plates on the wall as well. 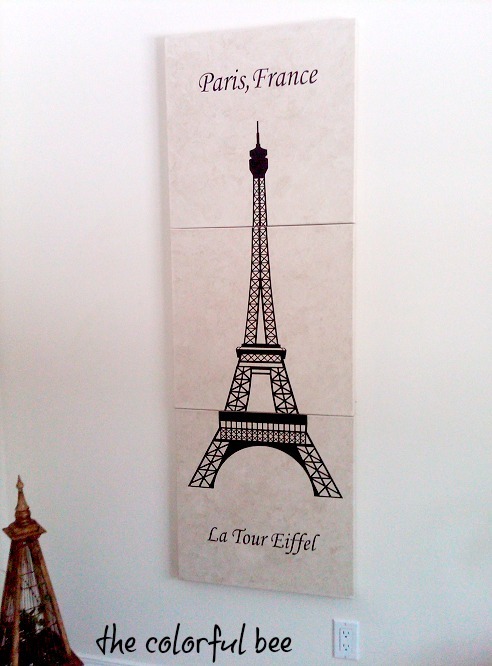 Another HomeGoods find, the Eiffel Tower vinyl appliqué ($12! ), turned into some artwork to fill a tall wall. I had 3 canvases collecting dust in my studio, so I painted and antiqued them and I added the appliqués. The powder room was so bland and white (with all of that black in it! )…it looked too stark. I talked the developer into letting me do a beautiful Sage Green metallic plaster finish on it. Much better! I donated an antique-looking ceiling fixture that I had purchase for a client who decided it wasn’t her style. Again, another item just sitting in my studio not being useful! Such a lovely French style home. Lucky owners! 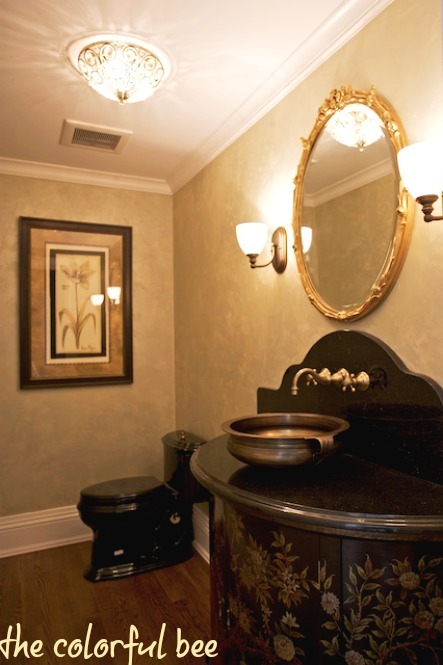 This entry was posted in Decorative Finishes, Home Staging, Makeovers and tagged home staging ideas, Long Island home staging, metallic plaster, metallic plaster in a powder room, new construction staging, real estate staging, staging a vacant home, successful staging of multi-million homes. Bookmark the permalink. Just love Home Goods, who doesn’t though. I have those same antique chairs that need scraping of old white paint, repainting, and some pillow forms. 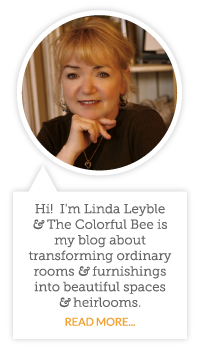 I loved seeing the staging of this home and all your furnishings. I have to pin and share this now!